DESCRIPTION: IWS recently completed a sustainable project for the development of a low income residential subdivision in the mountainous desert of Bullhead City, AZ overlooking the Colorado River. IWS recently completed a sustainable project for the development of a low income residential subdivision in the mountainous desert of Bullhead City, AZ overlooking the Colorado River. 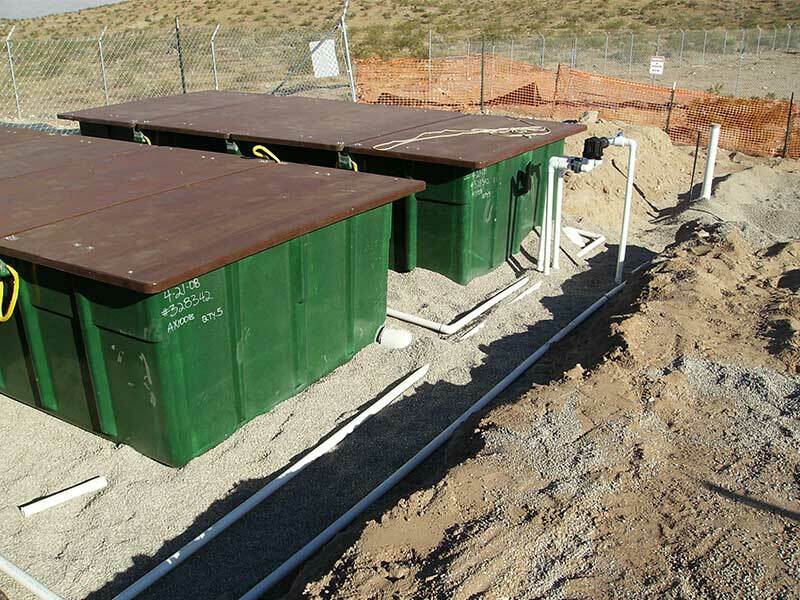 The developer, Adams Construction and Management Corporation (Adams) of St. George, Utah needed a construction firm that could collaborate with their civil engineering consultant to provide a turn-key wastewater solution for the second and third phases of the project. One of the goals of the treatment system was to protect the pristine desert environment. IWS utilized an Advantex treatment system in conjunction with Geoflow drip irrigation to meet the regulatory discharge requirements and the client’s need for subsurface discharge of the wastewater. The treatment system was designed to handle 12,500 gallons per day (expandable to 24,000 gallons per day) of domestic wastewater from 103 housing units. The system design included the following: a) Five AX-100 Treatment Units; b) Two, 25,000 gallon and one, 20,000 gallon primary tanks; c) One, 15,000 gallon dosing tank; d) One 25,000 gallon re-circ tank; and e) 20,000 square feet of drip irrigation. The wastewater treatment system was permitted under a type 4.23 Aquifer Protection General Permit which allows flows up to 24,000 gallons per day. Adams schedule required that the final design and construction be completed within 90 days from notice to proceed. IWS worked diligently with Aqua Engi-neering to complete final design details for tanks and treatment equipment locations as well as drainfield layout and design. IWS also worked with Todd Christianson of Premier Environmental Products, LLC (www.premierenv.us) of Pine, Arizona who is the Orenco representative for Arizona. The Xerxes tanks were provided by Sunbelt Industries, Inc. (www.sunbelt-reps.com) of Phoenix, AZ. Paul Durr of Adams said, “IWS was able to quickly take over the project from the permitting phase, expedite resolution of the outstanding design and constructability issues, and complete construction of the system to meet our schedule and budget”.